Based in the majestic surroundings of the British Columbia mountains in Canada, Silver Star has a warm and friendly charm that makes it ideal for families wanting to give skiing a try. With a wide range of great activities for adults and children alike, there is much to appreciate at this cosy, welcoming resort. However, Silver Star’s glowing reputation for families does not mean experts will feel neglected as there are plenty of challenging runs across the site, along with courses for intermediates and beginners. With the wonderful Okanagan Valley as its backdrop, the resort is among the most beautiful in Canada and is a fantastic location for travellers looking forward to working on their skills in a truly resplendent atmosphere. 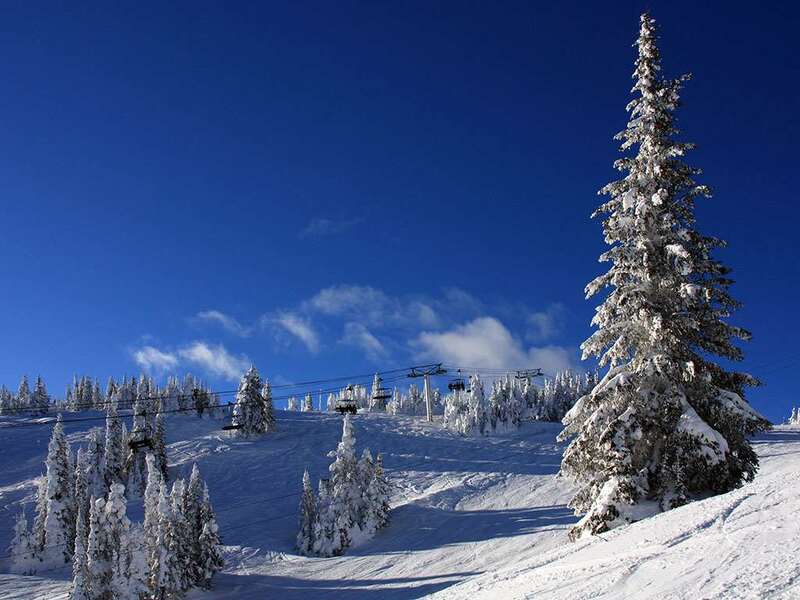 Silver Star is the 3rd largest ski resort in British Columbia. The extraordinary village has a variety of shops, restaurants and wellness facilities. Whether you want to spend a day on the slopes or relax with a drink and enjoy the stunning scenery, there is much to appreciate in Silver Star. The ski season here runs from November to April and an incredible average snowfall of around 700cm. The legendary champagne powder attracts skiers of all abilities to this wondrous playground. There is a total of 132 runs across the resort, along with two terrain parks. As well as this, the courses are split between beginner, intermediate, advanced and expert. Around 40 per cent of these are focused on intermediates, while 35 per cent and 15 per cent are aimed at advanced and beginners respectively. A further ten per cent are ideal for experts. Night skiing is also available, with 83 hectares of terrain available. Overall, there is 1240 hectares of skiable terrain across Silver Star, giving visitors plenty of runs to try. The Silver Star village is full of excellent restaurants, bars and cafes, providing the perfect place for tourists to relax after a day on the slopes. The Silver Grill is one of the top eateries here, offering a delightful selection of artisan food with amazing views of the valley. As well as this, shoppers will find a lot to explore, with a variety of winter sports stores on the site featuring some of the industry’s leading brands. Iglu Ski has a variety of package holiday options to Silver Star, including self-catering apartments at Creekside, Silver Star and Putnam Station, Silver Star. Most of Iglu Ski’s North American ski holiday packages are tailor made to your requirements; please call the expert ski team on the phone number above to discuss prices and packages to ski holidays in Silver Star. In March we spent 2 weeks skiing in Silver Star and it was amazing! The resort is very small compared to European resorts or larger N. American resorts such as Whistler or Vail. It is located in the Okanagen region, an hours drive from Kelowna Airport or 5 hours drive from Vancouver. In fact it has just 5 chair lifts but the variety of runs off each lift was impressive. On the frontside of the mountain there were ample greens and blue runs for you to cruise around on and perfectly suited to beginners and intermediates. In the Silverwoods area it is all about tree skiing with wide open gladed areas and also some tighter trees for those who like to turn quickly between them. On the backside is where the fun happens with lots of blacks and double blacks for any level of skier to be challenged. And the snow that covers the runs is superb, light, fluffy powder that falls from the sky regularly. The village, like the resort, is small but perfectly formed. All the buildings are painted bright colours and it has a very romantic charm. Accommodation can found to suit all budgets.The condo like almost all others in the resort was ski in/ski out which is brilliant, modern furnishings and had it’s own hot tub! We booked the kids in to ski school for morning lessons for a week and ourselves in for two morning lessons.The kids had the best time with them actually asking to go back for the afternoons! The instructors had a great rapport with the children and very patient and understanding. They made the lessons fun while teaching them some great skills and technique and we saw their skiing improve leaps and bounds. Our instructor was also great, as we are advanced skiers we just wanted a few tips to tidy up our skills and we had certainly got that, we even got filmed and had an opportunity to watch it back with the instructor which really helps you to see what we were doing wrong. I would return to Silver Star for the ski school alone! Seriously can’t recommend it enough! There is a good variety of dining options and bars/pubs but no nightclubs as the resort is much more suited to families. Our favourite apres stop was Long Johns, where a pitcher of beer will only set you back $12 and a huge burger with the best sweet potato fries for another $15. We also loved The Den which is a bistro style restaurant and bar with main courses around $25 and drinks are very reasonably priced with again a pitcher costing only $12. If you want to cook for yourself or get bored of the on mountain offerings the large town of Vernon is a 20 minute drive down the mountain. The lift pass is called the ‘My One Pass’ as all for the same price you get access to the ski lifts, nordic trails, tubing and ice skating! They have really positioned themselves as a fantastic family resort and also have a climbing wall and a bowling alley. Next year we are definitely going back. There is enough at Silver Star to keep you entertained for at least a week and you could combine your trip with other nearby resorts such as Big White (about 1.5 hours drive away), Revelstoke (2 hrs) and Sun Peaks (2.5 hrs). This resort is fantastic and I would would ski there again!